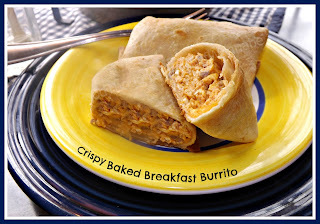 You know those breakfast burrito's you get at your fast food restaurant of choice, the one on the way to work or school, you try to pass it by, but it is to convenient and quick, the kids are hungry, you are starving.....yeah, THOSE. Well here is your make ahead answer! You can bet these are a hit at my house. We used to make these by the dozens and pop them in the freezer for mornings just like those I described! Pop them in the microwave and off ya go! But now, we like to take them up a notch. In my quest to fry less, I baked these and they came out fantastic. My husband was skeptical about making a "crispy" version but, he happily informed me, this is one of his favorite things I have ever made. I must be doing something right, eh? Perhaps he is so UNused to getting breakfast, he was speaking from a place of disbelief? Well they really are great, and they are baked not fried, I know that some of you will be overjoyed with that. I am sure you get chest pains when you see I have fried something! I can't help it, some things must be fried, end of story! Here is what you will need to get started. This makes 8 good size burritos! Preheat your oven to 400 degrees. In a skillet brown your sausage, cook until completely done and push to one side of your skillet. In a bowl crack 6 eggs and whisk, add into the side of the skillet you cleared and cook until scrambled. It makes no difference if they mix with the sausage, it just makes it easier to get them done faster. Combine all of the eggs and sausage together, add in salsa and mix until completely combined. Turn off the heat and let it cool down a bit. Prepare a cookie sheet by lining it with parchment paper and then brushing the parchment paper with oil, this will help the bottoms of the burrito's crisp up. Now lay out your tortillas and divide the mixture between all 8. Add cheese to the top of the mixture. Roll like a traditional burrito and place seam side down on your prepared cookie sheet. When all are rolled, brush the entire burrito with oil so it will crisp nicely in the oven! Bake for 13-15 minutes. You can flip these halfway through or just leave them as is. If you flip them they will be crispy on both side instead of soft on the top. It is your choice. I left mine and did not flip them. Serve with some fresh slices of avocado, side of salsa, or just plain!! Tomorrow I am making these! Yup! !